In Conan 1.4 we have introduced two new Conan generators that allow linking with your dependencies without changing your CMakeList.txt file with any line related to Conan. First of all, let’s review what a Conan generator is and show the pros and cons of both the classic and new generators. If you are consuming conan packages in your project, you typically declare a conanfile.txt file with some dependencies. In this case, we are building an application that uses libcurl to check the Github stars from the Conan repository. Conan has generated a conanbuildinfo.cmake file (corresponding with the “cmake” generator) with all the information about the libcurl dependency and all the transitive ones, in this case, OpenSSL and ZLib, and some macros we can call to ease the task of linking with our dependencies. In our CMakeLists.txt (shown above) we are including that file and calling conan_basic_setup(). Check if the specified compiler in the conan install matches the one detected by CMake. Adjusting the output directories, rpaths configurations, std library, runtime (only Visual Studio), fPIC flag, all according to the specified settings in the conan install command (default profile in this example). Prepare transitive targets (modern CMake) and needed variables (global approach) to link with the dependencies. Any of these automatic adjustments can be called individually instead of calling conan_basic_setup() so we can control exactly what we want Conan to do for us. This approach is pretty useful and the usage is very straightforward, but you need to change your CMakelists.txt file to include the conanbuildinfo.cmake file. Some users prefer to rely on the CMake find_package() feature to decouple the build system and the package manager. And not less important, we need to make the target_link_libraries in the correct order. So definitely, in this case, the transparent integration is far from ideal, we are losing precious information from the package manager, like the transitivity and the order of linkage. If you are not using Windows, the previous example will probably work. If not, you will still see linker errors because of the findCURL.cmake (provided by CMake). It is not linking with Ws2_32: Remember the CMake findXXX modules are not transitive, so you have to declare ALL the dependency tree in your CMakeLists.txt file. It is not propagating the definition CURL_STATICLIB needed to link correctly with the static library. Check the code in the folder cmake_paths_attempt3_windows of the repository. We can see that using the CMake provided findXXX modules is very far from being ideal because many information that the package manager already knows is completely lost: Both the transitive dependencies and definitions are declared in the package_info method of the libcurl recipe, but will never be applied if you use the CMake provided findXXX modules. The cmake_find_package is a different approach. It will generate one find<package_name>.cmake for each dependency from the information that Conan has about the dependency tree. We can use it with modern CMake target approach. As every target is transitive, libcurl target will contain the OpenSSL and zlib information too. If we would like to avoid the CMAKE_MODULE_PATH manipulation we could also use both cmake_paths and cmake_find_package generators and use it as a toolchain like in the previous example, it will adjust also the module path to locate our find<package_name>.cmake scripts in the current directory. CMake will try to locate the find find<package_name>.cmake scripts in the following order: First the packages folder, then the directory where we are building the project and finally the CMake installation/Modules directory. Wait… Is this really transparent? Probably you noticed that the find_package(CURL) has been replaced with a find_package(libcurl). And maybe you are thinking: Well, but the name of the findXXX files do not correspond with my classic find_package invocations in my CMakelists.txt. And I don’t want to change my CMakeLists.txt file and this is the only reason why I’m reading this blog post! Targets are transitive, so you will specify only the dependencies you are directly depending on. You don’t need to know if libcurl is depending on OpenSSL. Actually, the previous examples in Mac OSX use the internal Apple SSL implementation by default. And our CMakeLists.txt will work exactly the same in any system. Propagates definitions: Without the CURL_STATICLIB definition the build fails. This definition is declared in the package_info method of the libcurl package. Propagates linker and compiler flags: For example, to link with the SSL framework in Mac OSX, the recipe injects: -framework Security and -framework Cocoa but only in OSX and only if you do not force it to use OpenSSL. If you are consuming packages and you have high restrictions to change your CMakeLists.txt, probably the cmake_paths is the best choice. 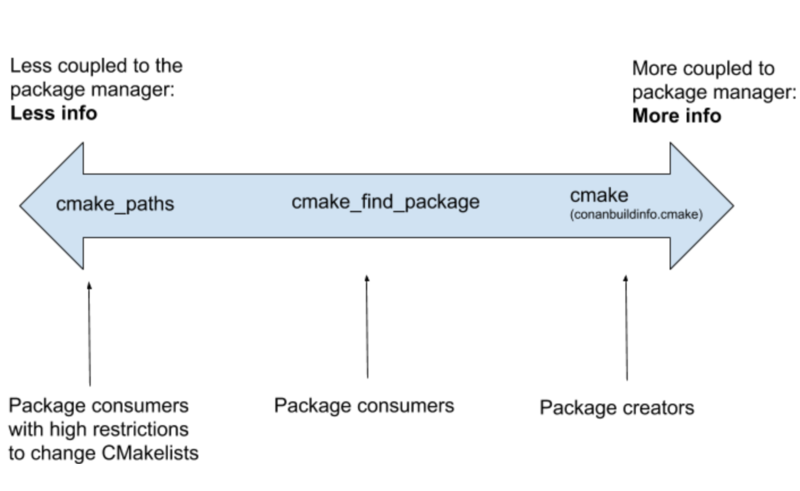 If you are consuming packages and you are looking for a way to connect the package manager and the CMake build system in a non-intrusive way, choose cmake_find_package. If you are creating Conan packages, we strongly recommend you to include the conanbuildinfo.cmake in your CMakeLists.txt file (you can always patch your CMakeLists.txt from the recipe!). 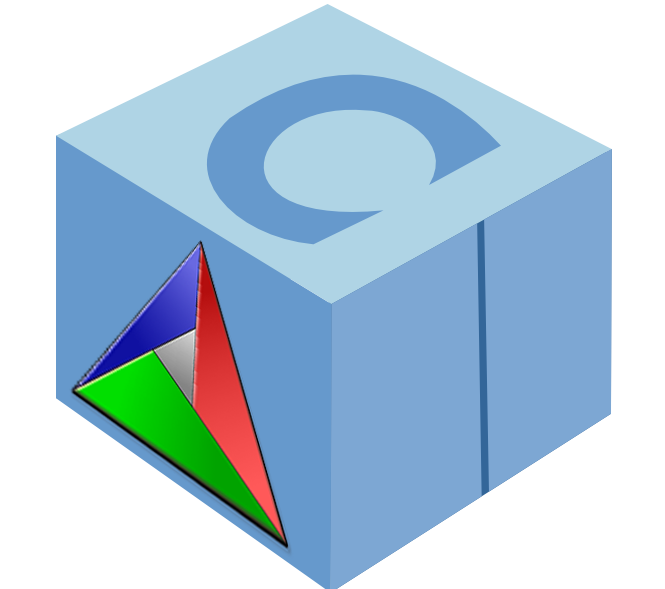 The classic cmake generator introduces to our build script more information from the package manager: The applied settings and options, the Visual Studio runtime, rpaths, compiler checks, standard library version and fPIC flag.